Campaigners have called on internet firms to take responsibility for the mental health of its users. 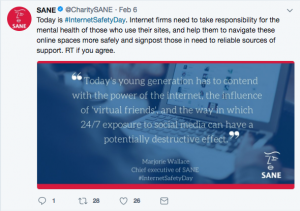 Marjorie Wallace, Chief executive of SANE and journalist, believes that constant exposure to social media could potentially be destructive on the youth of today. Ms Wallace’s claims are backed up by a study Royal Society for Public Health, and the Young Health Movement which revealed Instagram as the worst social media platform for young people’s mental health. The report called for measures to help protect users of social media platforms, a staggering 91% of 16-24-year-olds in the UK use the internet and other social networking sites regularly. It has seen rates of anxiety and depression in young people soar by up to 70% over the last 25 years. Counselling Directory member Jan Slater, believes that the relationship between children, their parents, internet and social providers is crucial. She said: “When parents become more aware and providers become responsible, then children can be better protected. Jan also described how the internet can potentially harm young people’s mental health. She said: “The internet has definitely had a negative impact on the mental health of some young users. Anxiety and depression appears to be increased with constant internet use; along with compulsivity — with a third of users considering the web to be as important as food, water and shelter. Children have ‘normalised’ being attached to the internet, as an everyday normal function of life. 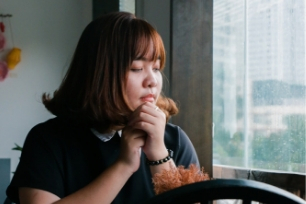 The stress and anxiety that is created by the need to stay ‘connected’ results in the young person feeling compromised and anxious when they are not ‘checking in’ to see what is happening with friends. She continued: “Although the internet allows more connections to others than ever before, it is not always the type of connection that is valuable or healthy; in some circumstances it is damaging or dangerous. “Everything that is the worst of human behaviour, can happen on the internet. Predators and bullies exist out there and grooming a child has never been so easy and so anonymous, with false profiles and pictures. One in ten parents have reported that their child has been bullied online, the consequences for some are devastating, with bullied children more likely to consider suicide. 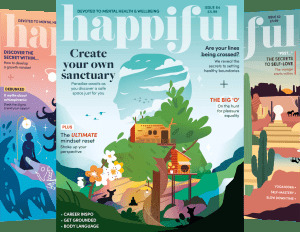 Speaking to Happiful Magazine in December, Childline boss Dame Esther Rantzen condemned cyber bullying and the effect of social media on young people. She said: “What the counsellors are telling us is social media – the illusion that it makes everyone feel a failure because they’re not attractive enough, they’re not beautiful enough, they haven’t got as many likes as their friends, or whether they are talking online about self-harming in a way that it provides a relief from pain.